On Saturday 19th January, 15 kids from Freedom Park Informal Settlement in Ottery enjoyed an outing to Sonwabi Beach, Strandfontein, which included a lunch. This was part of a joint Humane Education collaboration between Cicely Blumberg of Adopt a Pet and Marilyn Hoole of TEARS Animal Rescue. Marilyn rescues many Kelp Gulls along this stretch of coastline, which have become entangled in fishing line, with some of them caught “hook, line and sinker”. Cicely felt that it would be beneficial for the kids to spend time on the beach, cleaning up, and learning about the environment and life along the shoreline and in the sea. After meeting at Sunrise Beach parking area, we all drove to Sonwabi Beach, Strandfontein, the 15 kids being transported in the Adopt a Pet vehicle, by Pastor Noel Byneveldt and his wife Shareen, from Prophetic Faith Ministries. It was a beautiful day; with no wind, the sun was shining brightly and the sea sparkling. 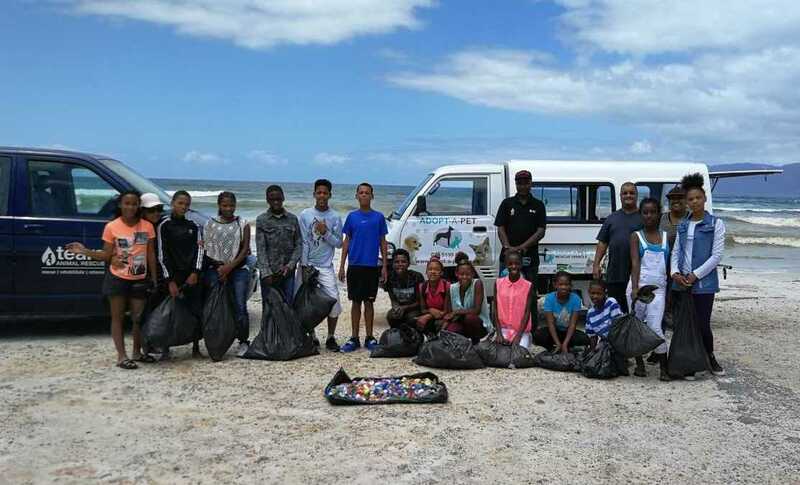 The kids were keen to get started, but before they set out on their beach clean-up, they were told about the birds who live on the shoreline and the creatures in the sea who are heavily impacted, and suffer terribly, because of plastic pollution. Everyone was given a black rubbish bag, and as an incentive, Marilyn offered to pay a rand for each plastic bottle top collected. Big mistake! Covering two kilometres in an hour and a half, the kids collected so much rubbish in 12 black bags, but the big surprise came when, after the clean-up, we counted the bottle tops – they had collected 1141 tops! Unbelievable! Thankfully Pastor Noel negotiated with the kids who were happy with 50 cents per top, and Marilyn emptied her purse, rewarding the kids for their tremendous effort. Cicely had provided a delicious lunch for everyone, which we all enjoyed, after which Marilyn, and volunteers Sue Oosthuizen and Eric Ndzube bade farewell to everyone as they prepared to go for a swim at Muizenberg. Cicely was overjoyed at the success of the event, as were we, and Cicely commented that it was with a great sense of pride that the founders of two pro-life organisations, who share the same ethos and passion for the welfare of animals could link up, after being associated for 23 years! Cicely’s Humane Education Programmes have been established in numerous impoverished communities, including Freedom Park, Sweet Home Farm, Factreton, Samora Machel, and Woodstock, where, with assistance from Pastors who work in the communities, she helps teach the children to respect all life, be it human or animal. Many children are so deprived and do not know much about life outside of the settlements where they live. For more information regarding Adopt a Pets’ Humane Education Programmes, please call Cicely on 021 4654560.